Marian Drew born 1960, Bundaberg Australia, lives and works in Australia. 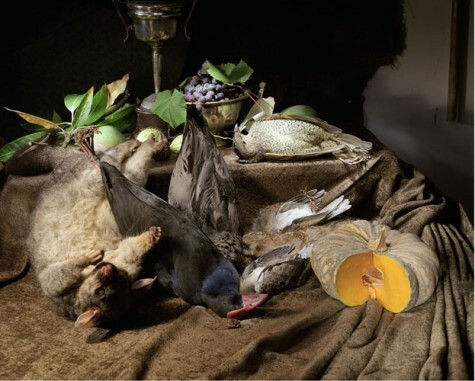 Marian Drew, a photographic artist, creates still life memento mori’s influenced by both Vanitas and 18th century European still life painting. 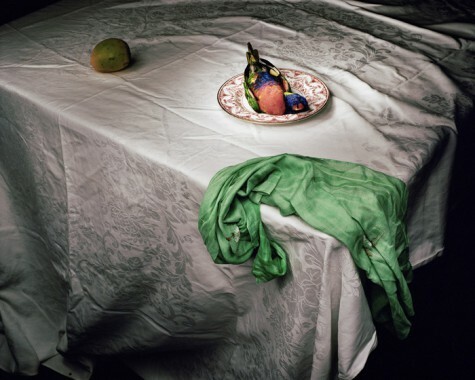 Each still life depicts an Australian native animal placed on a table with linen and other domestic objects such as fine china, candles, fruit and vegetables. 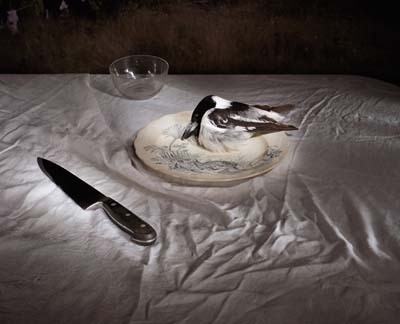 Each image has been beautifully lit, depicting the various settings through light and shadow, carefully composing each of the objects and native animals to create an uneasy stillness. 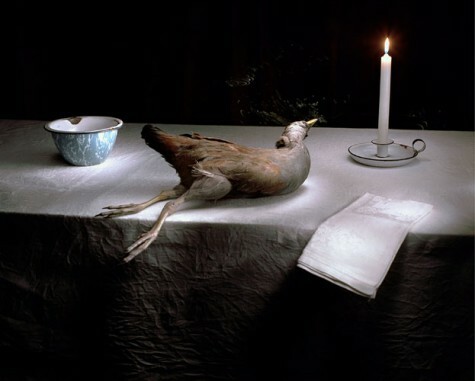 Drew photographs her still life images in a dark studio using long exposure and a torch light to paint the areas of light into the image. 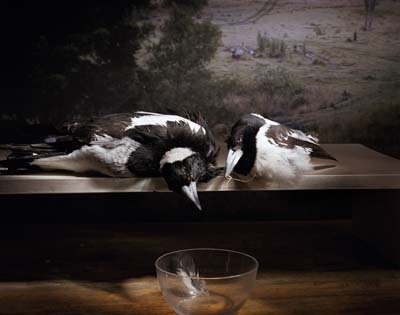 The photographs are exposed onto medium format film, requiring experiementation and bracketin,g as Marian Drew does not see the final effect of this ‘painting with light’ until after the film has been developed. 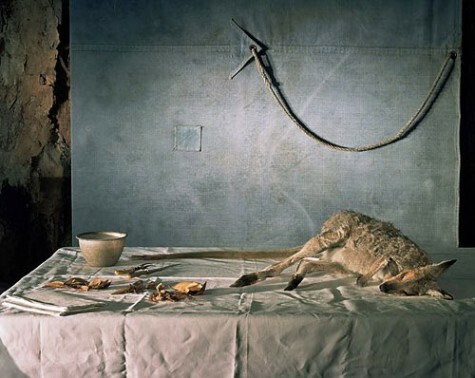 Its whilst viewing this domestic setting that an audience becomes aware of the limp stillness of each animal, the slightly unnatural composition of their limbs and bodily gestures. 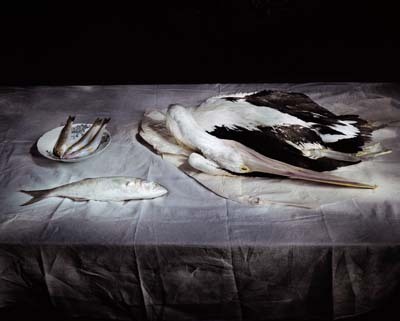 For each native creature is merely the remnants of an animal that has been killed through the evolution and expansion of European settlement in Australia. 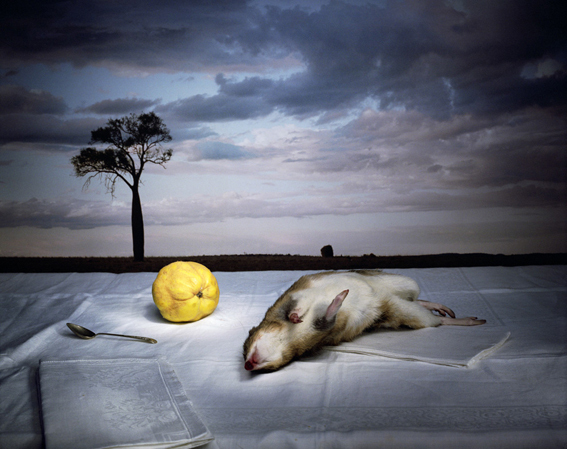 These creatures have been destroyed (either as road kill, by introduced predators, land clearing or urban development) and then collected by Drew to become part of her still life imagery. 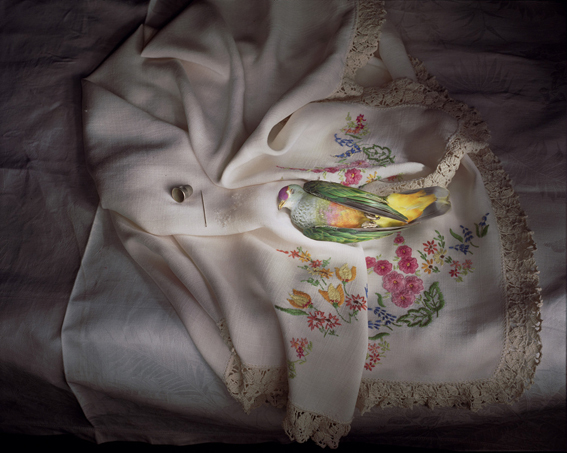 Such is the contrast between the embroidered fabrics, delicate china patterns, carefully considered colours and textures that are used alongside the carcasses from the deceased native animals in Drew’s Australiana/Still Life series that reference Vanitas painting and remind us of the fragility of our environment and its inhabitants as well as our own mortality. In the spring of 2003 I flew back to Brisbane after studying in Germany. The number of dead animals on the road in Australia was such a shock to me after being in Europe. 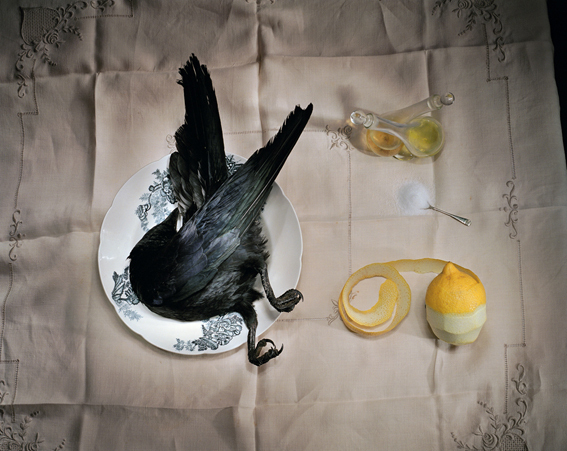 In all the historic still-life painting that I saw in Germany I found what I thought would be the perfect visual response to the road kill. My photographs are as much a response to my own environment as they are to my experiences of a different culture. In the course of daily life these native animals are killed by cars, domestic pets or power lines and are easily found scattered beside the roads through our urban environments. 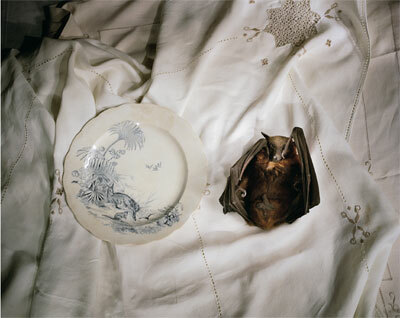 native Australian animals arranged on table tops with different linens and embroidery as well as various domestic household objects associated with the kitchen. 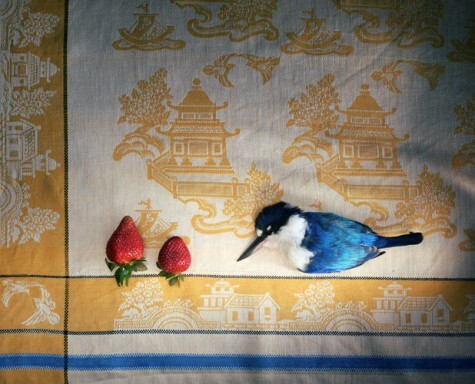 This entry was posted on 29/07/2012 by Emily Portmann in All, Australian, Photography.